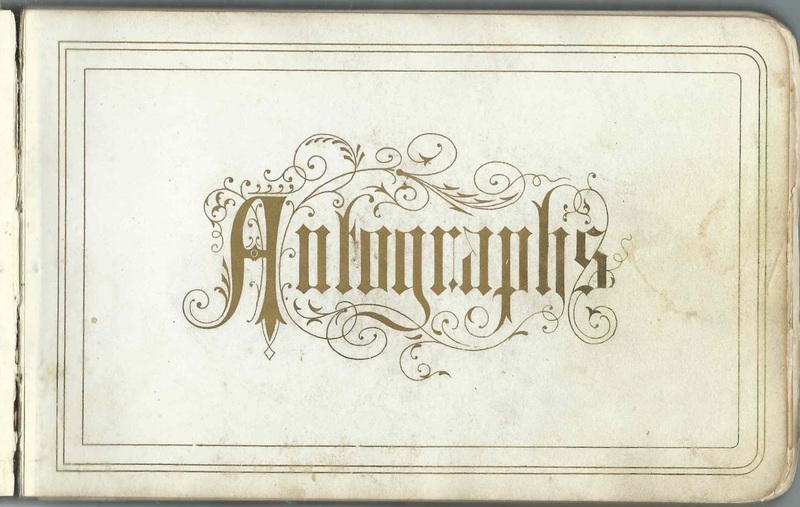 1876-1881 autograph album that belonged to Luella N. Williams, "Lou", who was a student at Almira College, now known as Greenville College, at Greenville, Illinois, when a majority of the sentiments were acquired. Many thanks to the Archivist at Greenville College for sending me the residences of many of the signers. 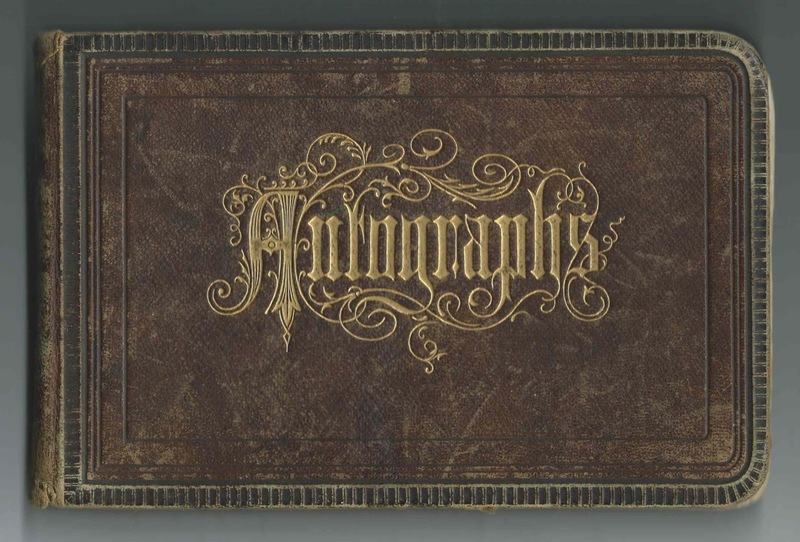 The album measures approximately 7-1/2" x 5" and contains the sentiments of about 100 people, a few of whom signed more than one page. Many were Luella's fellow students at Almira College. She apparently belonged to a group, formal or informal, called Q. Q. Several signers referred to Q. Q., and one page entitled Q.Q., with a graphic on its facing page, had four autographs on it, including that of Luella herself. The others were Belle Knowles, Lottie M. Palmer and Laura Newberry; they also signed individual pages. Another page, entitled "In Memory Of", was penned at Geneva, Illinois, on June 26, 1876 and lists five names. The facing page shows a cross and flowers. John B. Hoagland and wife Delia Hoagland, one of whom was presumably Luella's cousin by blood. G. Williams of Hornsby, Illinois; the middle initial might have been A.
Luella N. Williams, "Lou", was born August 29, 1856 in Illinois, the daughter of Madison and Lydia (Moore) Williams of Wood River, Illinois, near Alton, by the Mississippi River. Lou had, I think, five siblings. One of them, J. Abel Williams, was killed by oxen at the age of 13. Another, Mary J. Williams, died in 1866. Lou's oldest brother, Thomas Irby Williams, inscribed a page in her album as Irby Williams; he described how pleasant it would be when Lou returned home. There's a scrap of fabric tucked in this page. Luella N. (Williams) Hamilton died in 1940 and is buried in Upper Alton, Illinois, with her husband and her family. For more information on Luella's family, see here and here, information provided by the Alton Museum of History and Art at Alton, Illinois. Signers in the Album [Note: Given names within a specific surname may not be in alphabetical order.] Again, many thanks to the Archivist at Greenville College for supplying the home towns of many of the signers who didn't already do so. J. W. H. sketched a spray of flowers and wrote Luella's name in fancy script. 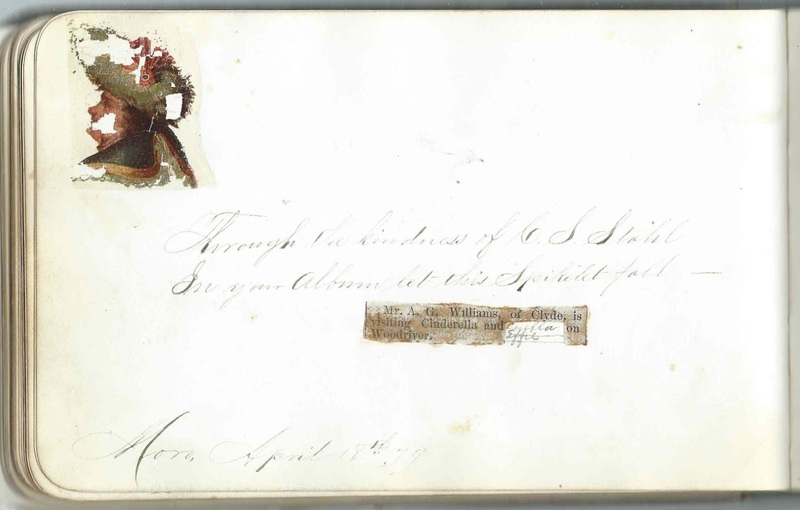 Sallie, signed in July 1878, possibly initials S.M.B. "loving Friend Quip". The page is full of reminiscences; mentions Q.Q. Z. F. C. or Z. F. E.
Etta Baker of Pin Oak, Illinois, signed at "College House" on June 7, "Centennial", 1876. Almira College at Greenville, Illinois. Loretta Baker. L. Boeschenstein of Highland, Illinois, signed at Almira College on March 10, 1877. "Say girls, won't you let me have some fire?" W. Crawford; middle initial might be I.
Leon S. Dorsey, signed at Moro, Illinois, on February 16, 1879. "P.S. Remember our old friend 'Houdan'"
James Hamilton of Tombstone, Arizona, signed on December 3, 1883. Middle initial possibly G or Y or ? Effie N. Hamilton of Wood River, Illinois, signed on January 21, 1878. She may have been the sister of Luella's future husband, Thomas Hamilton. Rebecca Henson of Greenville, Illinois; signed at Almira College on June 9, 1877; floral design on page. Delia Hoagland, signed on December 1, 1877; "your cousin"
John B. Hoagland, signed on December 1, 1879; inscribed "To Cousin Lou"; his wife Delia also inscribed a page. I don't know which of them was Luella's blood cousin. B. Knowles; sketch of a man's head; mentions Q.Q. Belle Knowles, who signed other pages. Belle Knowles, 31. Presumably D. Belle Knowles of Fillmore, Illinois. On a page entitled "Q.Q., with Lou Williams, 42 [the album owner]; Lottie M. Palmer, 50; and Laura Newberry, 99. Signed by "31", who may have been Belle Knowles, judging from a group page where she was identified with that number. Ella Lumsden, signed on April 24, 1877; sketch of three bonneted girls dancing. M. Ella Lumsden of Virden, Illinois. Laura; her page is full of reminiscences. Presumably Laura Newberry, who signed other pages. Signed by "99", who may have been Laura Newberry, who identified herself with that number on a group page. Lottie M. Palmer of McLean, Illinois, signed at Almira College on June 10, 1876; she signed other pages as well. Signed by "50", who may have been Lottie M. Palmer, who identified herself with that number on a group page. Hattie E. Simpson of Collinsville, Illinois, signed at Almira College on June 20, 1877. "Graduates '77"
C. S. Stahl, signed on Monday, April 18, 1879; pasted a clipping that reads: Mr A. . Williams of Clyde is visiting Cinderalla...[handwritten: Luella, Effie] on Woodriver. Effie may have been Effie N. Hamilton, who signed another page. Phel. A. Thomas of Xenia, Illinois, signed on June 9, 1876 at Almira College; Ophelia A. Thomas, who married John R. Chatham. 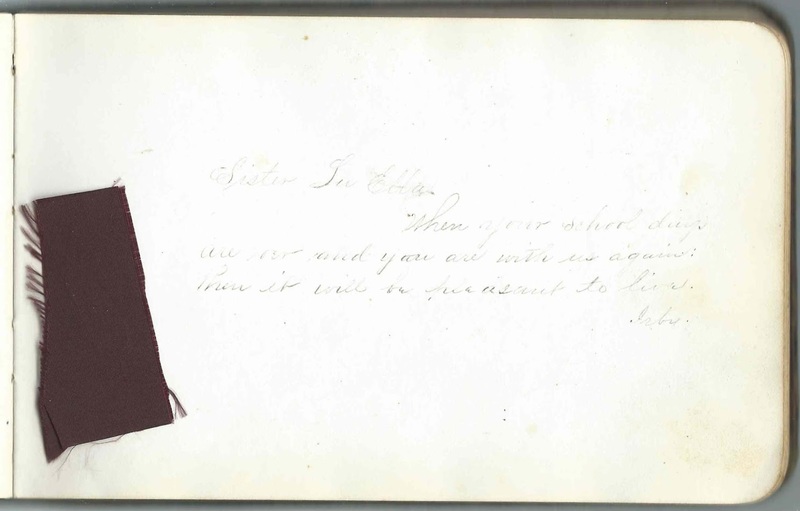 Irby, inscribed to "Sister Lu Ella"; refers to how pleasant it will be when Luella's school days are over. He was Luella's brother Thomas Irby Williams. Lou Williams, 42 of Upper Alton, Illinois. On a page entitled Q.Q., with Belle Knowles, 31; Lottie M. Palmer, 50; and Laura Newberry, 99. May Wyllie of Marissa, Illinois, signed on June 12, 1876; "Classmate in Algebra"